What is Disc Golf? It’s golf … with discs. 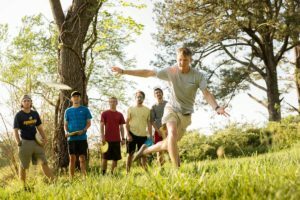 The Reinhardt University Disc Golf Course is a 9-hole course and accessed through Hasty Student Life which offers a disc golf experience for the beginner and pro alike. The course is 2,278 feet long, par 31, and demands accuracy among the pine and hardwood trees. The course winds beside the popular Lake Mullenix and East/West Apartments. Discs are available for check from Reinhardt Central, compliments of the Student Government Association. Additionally, portable disc golf targets are available for check out from Reinhardt Central located in the lower level of the Hasty Student Life Center. The course is open year round from dawn to dusk. The course is open to the public. Score cards and a course map are available online and in the kiosk located on the lower level of the Hasty Student Life Center next to Reinhardt Central. Please check the web-site frequently for any course closures. To reserve the Disc Golf Course, please call the Office of Student Affairs at 770-720-5538.